Porcelain veneers are used as a modern method in cosmetic dentistry to repair or build a brilliant, bright smile. Probably the biggest appeal for porcelain veneers is that they deliver dramatic results with minimal invasiveness. No Staining with Proper Care. Porcelain veneers come in custom shades to match your smile. A full work-up of veneers means you can maintain that bright Hollywood smile without having to routinely whiten your teeth. They Look and Feel Natural. Porcelain veneers are custom-shaped to cover chips, cracks, broken teeth and fill gaps. They’re not a one-size-fits-all, so they are made to look natural. Porcelain veneers also reflect like in a similar manner as enamel, so they really look like the surface of your natural teeth! They are also bonded to the tooth, not adhered with dental cement, so they are durable and should last for several years with proper care. Minimally Invasive. Porcelain veneers only cover the front of the tooth, meaning there’s no need to significantly reduce the tooth enamel (damaging it) to fit over the entire tooth, such is the case with a crown. Minimal maintenance. As with real teeth, don’t chew hard objects, brush with non-abrasive objects, and inform your hygienist that you have veneers before cleanings. Self Confidence. This is probably the best benefit and reasons we love them. Having a great smile means showing it off and smiling more often. People are drawn to those who smile and it’s a never-ending cycle of building that self-confidence. 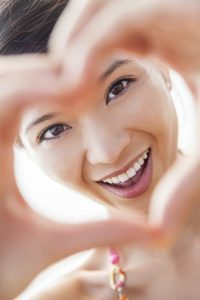 Are you ready for your smile makeover? Contact our office for a consult to see how we can get you the smile you’ve always dreamed of!